The German Spitz is actually a close relative to the Pomeranian, resembling them closely in size and appearance. Spitz come in a variety of ways, different in colors as well as sizes. 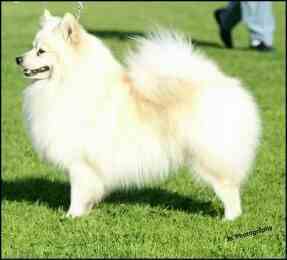 There are three sizes of the German Spitz: giant, standard and toy. The giant actually isn\'t giant at all compared to other Mastiffs and Samoyeds that developed around the same areas. They are fluffy, highly-feathered dogs with perfectly proportioned bodies. They have a large coat that requires quite a bit of maintenance, but most are unable to resist their "smiling" faces. German Spitz are a confident breed, doing well in the show ring, as long as you can train them. They are not as obedient as other breeds, however, so training must begin early. They are affectionate and loving, demanding attention when they want it. Some say the German Spitz is like a child, anxious to please, yet pushing for their own way, and manipulating to get it. Some have been known to be aggressive towards strange dogs or strange people, making them good watch dogs. They are active, intelligent, alert and independent, yet still cannot resist the attention of their owner. Charming and adaptable, the German Spitz is the perfect companion for an owner with a lot of care. German Spitz are confident, refined, and are happy to join you on a long walk. They have been said to behave much like a child: anxious to please, yet still trying to get what they want. Some are not happy around strangers or strange dogs, and they are not easily trained. Some are yappy if not taught when barking is ok. German Spitz are alert, watchful and affectionate to their owners. They will enjoy exercising or cuddling by the fire. They have a hierarchy among the breed, allowing the youngest adult to play with puppies when a litter is present. They are happy and bouncy, always yearning for attention. They are active, intelligent and devoted to their owners. They are often reluctant towards grooming. German Spitz\' coats are long, dense, double coated and stand off fur. They are fluffy and soft to the touch. Dental problems, luxating patellas, patent ductus arteriosus (congenital heart defect), PRA (Progressive Retinal Atrophy), and tracheal collapse. They should be exercised only moderately, with a daily walk as a good exercise. Training should begin early in life, as they are not easily obedient. They need firm positive training, and if not trained they will probably yap a lot. They are easily bored with repetitive tasks, and therefore should be kept entertained.